Everybody ages and when we age we will lose our hair color. No matter what color our hair is, there will come a time that it will turn into something drab and grey. Why does our hair turn grey? The answer lies in the chemical known as melanin. Melanin is the same pigment that lends color to our skin. The darkness or lightness of hair and skin color depends on the amount of melanin being produced by the body. This amount is generally determined by genetics. Melanin is produced naturally by the human body. When exposed to sunlight, our bodies tend to produce increasing amounts of melanin to combat UV ray absorption into our skin. As a result, our skin turns dark when we are under the sun for too long. Thus, the darker our tan is, the better for us, because it means our skin is protected from harmful UV rays. In the same way that the skin is protected from the sun, so is our hair. Dark haired people don’t suffer from sun damage to their hair because of the amount of melanin in each strand. Even when a person is fair skinned, as long as he or she has dark har, the melanin still functions as a protective shield against the sun. According to a study at Yale School of Medicine, melanin in hair follicles of dark-haired people is more beneficial than the type of melanin found in blondes and redheads. The type of melanin also vary widely depending on one’s ancestors, whether Swedish, Irish or Dutch. What happens when melanin is gone? The melanin in hair follicles is very important. If it goes away, we also lose our protection from the harmful rays of the sun. The sign that we are losing melanin in our hair is that the strands turn into grey, and proceeds to turn completely white or silver as the person ages. Hair strands turn grey when melanocytes inside the cortex are gradually dying from loss of protein because of aging. The melanocytes are cells that produce the chemical, melanin. These melanocytes are found in the cortex, the inner strand of hair is mostly composed of the protein called keratin. Inside this tube, soft rectangular cells (melanocytes) determine the concentration and depth of melanin pigment that produces our hair color. As we age, the melanocytes gradually die off, and no new cells are regenerated. The less melanocytes inside the strand, the less melanin is produced. And the strand shrinks and begins to dry out. Meanwhile, the color and texture of the hair begin to fade. The presence of grey hair is often associated with aging, but this is not always the case. 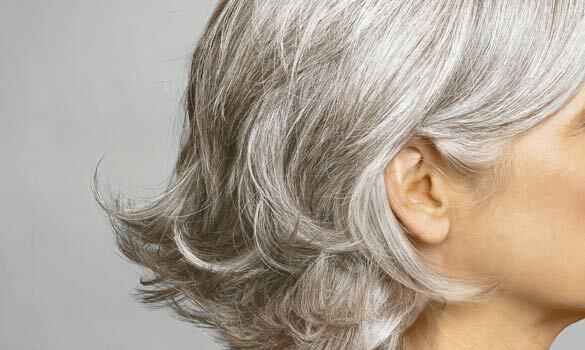 Grey hair can also be influenced by stress. A person experiencing a prolonged period of stress and anxiety may notice, over a period of time, white hairs gradually appearing. Malnutrition, worry, shock, deep sorrow, tension and other similar conditions may also slow down the production of melanin resulting in grey hair. Severe illness, too, can stop or affect the production of melanin.